Since February 2002, a new Steve Hackett compilation is available in stores. The first compilation, The Unauthorised Biography (Virgin 1992) offered an overview of the “early solo years” and two hitherto unreleased songs, which made it a worthwhile acquisition for fans and newcomers to Hackett. The same can hardly be said about the current release. The selection of songs on Genesis Files is restricted to just a couple of records. To be more precise, this thing is just a re-release of Genesis Revisited with some additional tracks from Darktown and The Tokyo Tapes. This is part of Snapper Music’s concept of the “Recall 2CD” series, and one wonders if this release was necessary. If nothing else, it is a good advertisement for Hackett’s own label Camino Records because this CD is sold at the price of 9.99£ [approx. EUR15,00]. Some people may care to find out about other solo efforts by Hackett if they liked this CD. The album opens with two Genesis classics from Revisited: Firth Of Fifth and Watcher Of The Skies are great versions with John Wetton doing vocal duties. The next piece, Riding The Colossus, was only available on the Japanese edition of Revisited. This number, however, has nothing to do with Genesis, and neither have the next two songs, Rise Again (from Darktown) and Valley Of The Kings (from Revisited). Time Lapse At Milton Keynes has at least an indirect link to Genesis: Steve was inspired to write it by the legendary 1982 Genesis reunion concert in Milton Keynes. It was also released on the current edition of the Bay Of Kings CD. On this release the calm number for acoustic guitar breaks the flow of the album. It is followed by a triple pack of Genesis Revisited songs: Your Own Special Way, The Fountain Of Salmacis and For Absent Friends all differ very much from the Genesis originals from the early 70s. Twice Around The Sun (from Darktown), an impressive instrumental with no relation to Genesis, closes the first CD. 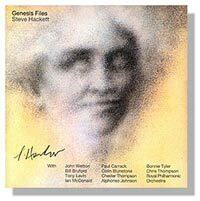 CD2 begins with the only recording on this album that had not been released before: A new grandiose version of Hackett’s acoustic classic Horizons. Avid fans need to buy this CD for this song alone, even though it’s the fourth interpretation of this piece on a Hackett solo album. The next song does not fit the album title. Neither is it a good successor to the previous number. It’s Prizefighters from Feedback 86 and features Bonnie Tyler and Chris Thompson on the microphones. The rest of the second CD is a mixture of live tracks from The Tokyo Tapes and studio tracks from Genesis Revisited. Or is it a mixture of Genesis and Hackett classics and curiosities? It’s both. Camino Royale is a Hackett classic, I Know What I Like a great Genesis song. Déjà Vu and Waiting Room Only (both from Genesis Revisited) are peculiar pieces. Déjà Vu developed from the memories Steve had of a song Genesis and Peter Gabriel were working on in 1973 but which they never finished. Waiting Room Only is a deliciously weird version of The Waiting Room from the Lamb Lies Down… album. It has little in common with the original, but it’s brilliant number. Four classics bring the album to a close: Dance On A Volcano (Genesis Revisited version), The Steppes, In That Quiet Earth and Los Endos from The Tokyo Tapes.